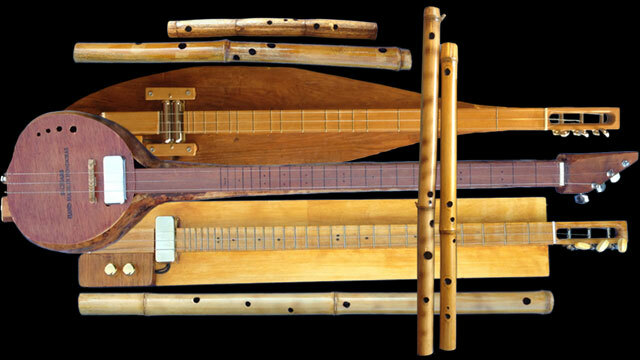 I compose, improvise, and perform instrumental rural space music focusing primarily upon instruments that I hand-build such as chromatic dulcimers, mountain dulcimers, and tone-hole flutes. I work alone and with my trio Twang Darkly, releasing recordings via youtube and through streaming, download, and CD. You can find out much more about me, my music, and how others have responded to my work, or just take a look at my artist resume. I experiment with filmmaking and animation as source material and visualization for music. In 2016, I paired my 2D animation and experimental music with the work of a mixed-media artist Steve Zihlavsky to create a museum exhibition, The Court of King Skebal. In 2014, I received a SRAC grant to create Martian Archaeology, a mediation on imagination and knowledge, realized through original animation and music. I've done artist-in-residence gigs in Nevada and Sweden in recent years. I also do professional web and multimedia consulting, with a particular focus on database driven web tools.